For those on a budget and looking for a gaming projector that also serves as home theater projector, they will not be disappointed with the results of the Optoma PT110 projector that is currently available for less than $200 with FREE shipping at Amazon (see details). You can also browse the list of other best selling projectors here. The Optoma PT110 is a 100 LED lumens projector which means it does not get very hot while functioning for hours and due to LED lamp inside there is almost no need to replace the lamp after just a couple thousand hours of usage. However Optoma PT110 has been marked with an estimated lamp life of over 20,000 hours which is more than enough for several years of multimedia experience. The Optoma PT110 supports native resolution of 854 x 480 while resolutions that it supports are up to 1024 x 768 via VGA input and up to HD 1080p via HDMI input. The projected image can be from 10″ to 140″ (diagonal) in size while the projector and the screen can be placed from 18″ up to 256″ apart. 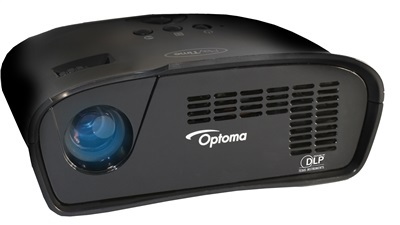 The Optoma PT110 has a contrast ratio of 1000:1 and with 100 LED lumens this cannot be a replacement for conference room projectors with moderately lit environment. For this to perform up to its capabilities, some level of darkness is desired. The PT110 has just one built-in 3W speaker and the projector consumes a maximum of 32 Watts of power. The PT110 weighs just 1.9 lbs and measures 197mm x 80mm x 199mm only. Where To Buy Optoma PT110 Projector ? 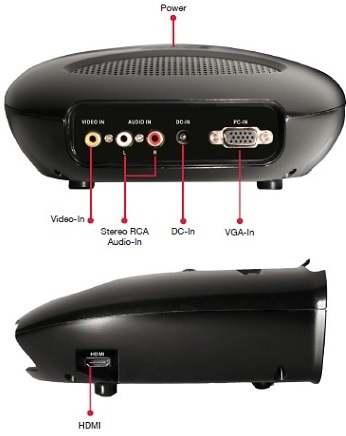 You can easily buy Optoma PT110 WVGA LED Projector from Amazon.com (see details) plus you can also browse the list of other best selling projectors here.